It’s always sunny in Teanaway! Purchased by Washington State in 2013, Teanaway Community Forest is the first of its kind in the state of Washington. Its unique designation is meant to protect this wild forest land while giving local groups a say in the land’s management, and is a testament to the passion that outdoor enthusiasts have for this Ponderosa Pine-filled valley. 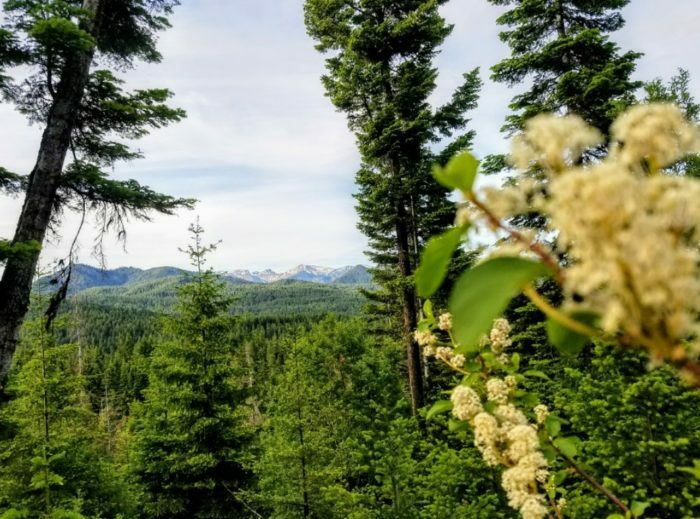 Nestled between Wenatchee National Forest and farmland, Teanaway is an oasis for rare wolf packs, wildflowers, and spotted owls. We at Northwest Trail Runs are excited to invite you to this sunny valley, to a truly wild trail run, and catch a peek of Mt. Stuart along the way. 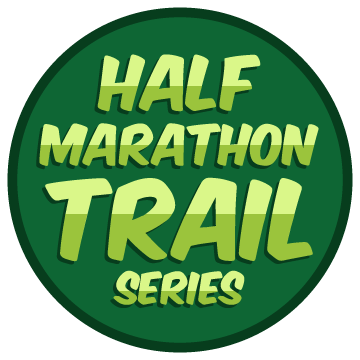 This event is part of the Half Marathon Trail Series, and runners in the Half Marathon distance will earn points toward their series standing. You can read more below or on the Half Marathon Trail Series page. Use the red registration button on the left to register for multiple Half Marathon Trail Series events at once. Register for two races to get a 5% discount on your entry fees, three races to get a 10% discount, and four or more races to get a 15% entry fee discount. The green button on the right links to registration just for this race. Online pre-registration closes Friday, May 31 at 11:59pm. 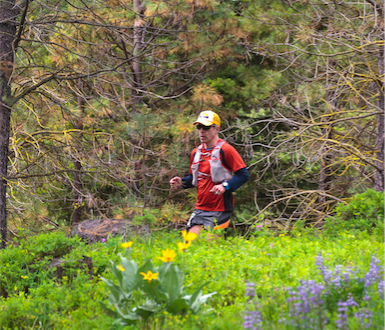 The course follows primarily dirt logging roads of various ages, as well as some smaller trails through scattered forest, a few meadows, and past sandstone slabs. At times you can catch a peek into neighboring valleys. There is moderate elevation gain, as is listed below. The half-marathon course is one large loop. Those running the 5k and 10k will each follow the half-marathon loop, but with a well-signed shortcut for each of the shorter distances, while marathoners will complete the half-marathon loop twice. Aid stations offer water, electrolyte drink, and some carbohydrate-rich or salty foods, such as cookies, pieces of energy bar, gels, chews, chips, bagel, fruity candy, fig bars, peanut butter and jelly sandwiches, and/or bananas. The start, finish, and registration area is located on W Fork Teanaway Road, just past the split with Teanaway Road Middle Fork (stay left to keep on W Fork Teanaway Road). There is a gravel parking lot here; please be mindful to park efficiently next to other cars; don’t leave wide gaps between you and other parked cars. A Discover Pass is required to park & camp inside the Teanaway Community Forest. One day passes are NOT sold on-site, therefore you must pre-purchase your pass ahead of time. Click here for a list of locations where you can buy your pass ahead of time. The Sportland Mini Mart Inc. on 4400 Bullfrog Rd in Cle Elum is the closest location to the start and finish that sells Discover Passes. Be prepared to not have cell reception while you’re approaching the venue! You may want to print directions. Come a day early and enjoy exploring more of the Teanaway at The Teanaway Navigation Race! Offering an hour of free beginner training, and 2-hour, 4-hour, and 8-hour race options, you make it a weekend full of adventure! 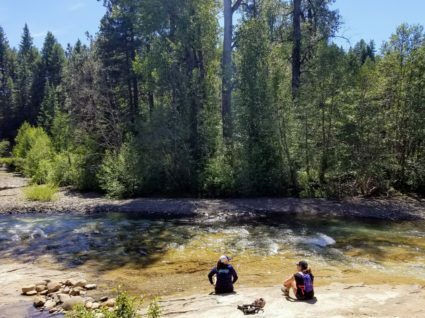 Make it a beautiful and leisurely weekend by camping at West Fork Teanaway Campground, less than a mile from the start! This is a free campground with pit toilets and no running water or power, but you will need a Discover Pass to camp here (see details under Driving Directions & Parking above.) There are not designated camping spots, just a lot of flat, open space for you to pitch your tent. West Fork Teanaway Campground (showing as “Teanaway Campground” on Google Maps) was formerly operated by American Forest Resources and was recently transferred to the state within the new Teanaway Community Forest designation. West Fork Teanaway Campground is very large, with tons of space to pitch a tent, and should not fill. However, in the unlikely event that it does fill, you can camp at Eagle Valley, on the south side of I-90, or try one of the other campgrounds in the Teanaway Valley, Indian Camp or Twenty-nine Pines. If you prefer warmer and softer accommodations, Cle Elum is just a 30-minute drive from the start, and offers numerous hotel options. 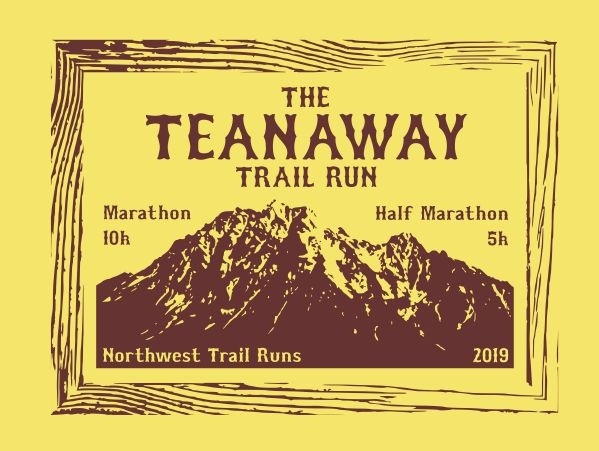 Tech and cotton T-shirts with new custom artwork for The Teanaway Trail Run are available for purchase with online registration and can be picked up onsite at the event. The tech T-shirt is Carolina Blue with a dark blue print, and the cotton T-shirt is a sunny (like the Teanaway Valley) Cornsilk Yellow color with a warm brown print. Teanaway apparel will not be available for purchase on event-day. There will be our usual Northwest Trail Runs series apparel available, with payment in cash only. The trails will be open to other users during the event, including pedestrians, bicyclists and equestrians (horseback riders). Please be courteous. Horses have the right of way. If you encounter a horse in your path, stop running and talk to the rider. You will probably need to step to the side of the trail to let the horse pass, but sometimes the rider will tell you it is okay for you to walk past. The amount of trail traffic will depend upon the weather. Participants are responsible for their own safety while participating, and the organizers are neither qualified nor equipped to render medical care in the event of a serious injury. In case of an emergency, call 9-1-1. You are encouraged to bring a cell phone with you as a safety precaution, if you wish. Where the trails are narrow, please let other participants pass you if they want to get by. It is a passing runner’s job to tell the person in front that they wish to pass. 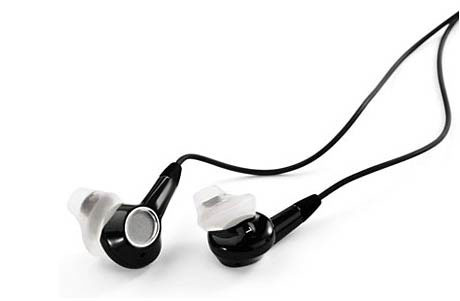 If you are wearing headphones during the event, please keep the volume low so that you can hear runners behind you. Be especially mindful that runners may be asking you to step aside so they may pass. Our events are USATF sanctioned and subject to USATF policies, and so dogs are not allowed to accompany runners on the course. Our website was built by Y-Designs, a Seattle-based web design company.